An ancient cosmetics table featured the usual items we would expect today: perfume jars, powder boxes, hand-held mirrors, etc. However, Greeks, Romans and Etruscans decorated these domestic pieces with unexpected scenes from mythology, ranging from scenes of warfare to heroic battles against monsters. What did the violent and the ugly have to do with a personal quest for beauty? James Rutherford Hume is an Instructor with the Department of Classics and Religion. 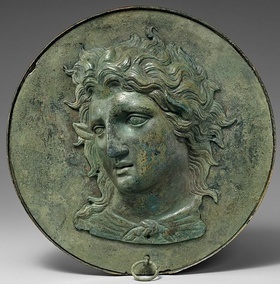 Image: Bronze mirror box with the image of Pan, 4th century BCE. MET DT5193. Wikipedia Commons.